On 1 October 2017, Las Vegas was the site of the worst mass shooting in American history. While every shooting has its own uniquely horrific repercussions, the scope of the Vegas shooting - with 58 fatalities and over 500 people injured - is so monstrous that it's impossible to fully comprehend. And our ongoing dialogue on gun control and the various marches and protests don't really tell the full story of any mass shooting; what it's like to live through one or watch someone die in one or live with the aftermath - individually and as a community. JH Williams III and Wendy Williams, who live in Las Vegas, responded to the shooting by pulling together one of the most anticipated anthologies of 2018. 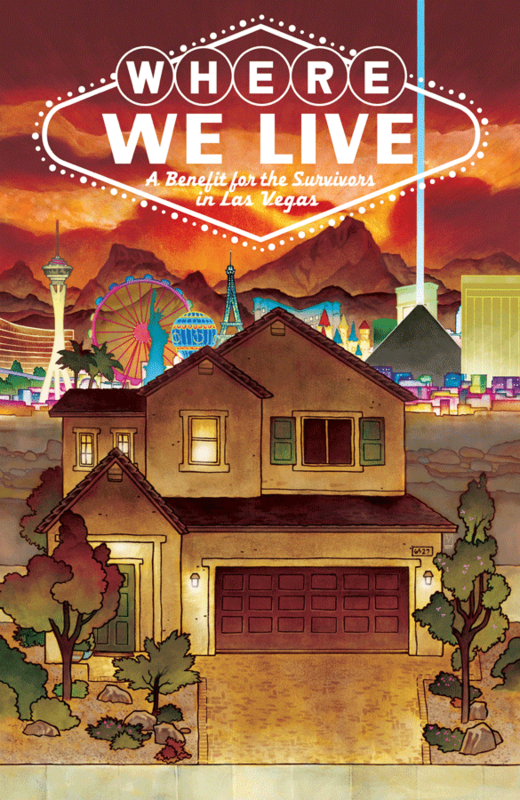 Where We Live features more than 70 stories by creators like Gail Simone, Mike Mignola, Jeff Lemire, Neil Gaiman, Mark Millar, Kieron Gillen, Joelle Jones and others. It's out in stores on March 30, with all proceeds donated to survivors. I talked to JH Williams III and contributor Dan Hernandez about the anthology. Did you have the idea for Where We Live right away after the shooting? Williams: Not immediately. We were shell-shocked for quite a few days afterward, after the incident. It didn’t really start to set in that we could do something until later in the week. But during that time it was a helpless feeling, one that carried over from that awful night. That following Friday, I kept thinking there had to be something we could do beyond the obvious of giving a little money or giving blood. I started randomly posting on Twitter in the middle of the night that maybe a book should be done, but had no idea how to even do it, how to go about organizing it. By the time I woke up the next morning I had responses from people offering to help. So that’s when my wife Wendy and I decided to try and do it, to create a book that raises funds while also serving a purpose of addressing the gun violence problems we’re all facing. We refused to remain feeling helpless. An event of this magnitude – you think “This will be the one that changes things” and then nothing changes. There’s a predictable media cycle and the story fades and eventually, a kind of learned helplessness sets in. Were you hoping this would inject more energy and impetus into the dialogue? Williams: Yes, exactly right. We’re never going to get to solving the problem if we don’t act. Just looking for acceptance that this is the “new normal” is a copout. I’m sick of hearing that this is the “new normal”, there is nothing normal about this whatsoever. The book doesn’t claim to have answers to the problem, but it does go into how this problem is seriously affecting the country, going beyond just statistics. The news cycle always focuses on the statistics, especially over time, as if that changes anything, to most people it just becomes a number. We need to be discussing what this problem is doing to people’s lives. And for many of those people, they will be dealing with the aftereffects for a very long time, and possibly for the rest of their lives. This needs to be acknowledged. We want others to consider how a shooting incident like this might impact their own loved ones if they were unfortunately caught in one. The book speaks to that in various ways. What kind of work will readers find in the anthology? Comics and what else? Williams: We felt right away that it should be a book open to all forms of expression. We didn’t want to hinder anyone by forcing it to be all comics. So, besides comics, we also have numerous essays speaking about a variety of topics related to the issues, spot illustrations, and some poetry as well. And some of the comics' stories are allegorical, with underlying messages speaking to the themes in the book. We wanted it to be open for contributors to work in whatever way they felt they could be their strongest. Dan, you're a journalist who's in the book. How did you get involved? Hernandez: When the editors invited me to contribute I immediately said yes. I’d been reporting on the shooting for weeks, interviewing survivors, first responders and therapists. So this was a way to give back. We’re spreading awareness about issues like the need for common sense gun laws, which is important. But we’re also directly benefiting the healing process by contributing proceeds to a treatment fund. I don’t know if anything like this has existed before. People associate comic books with escapism, since they’re usually about superheroes in a fantasy realm. But these artists are well aware of the way American politics and the gun lobby have contributed to the plague violence in this country, and I’m glad to help them use this genre to take a stand. I’d imagine that storytelling can more effectively humanize both the victims and survivors than a typical news story, which tends to focus on the shooter. Was that your intent? Williams: Yes. When we started outlining the content goals of the book, we quickly knew we wanted to see if any witnesses and first responders would be willing to participate. We felt it important for readers to see those stories and understand those experiences in a meaningful way. We ended up with a variety of stories that discuss that night and its immediate aftermath in powerful ways. That was some difficult stuff to deal with, emotionally. But I’m glad that we did it. It’s important, it shows that they matter. Did any of the contributors’ work or viewpoints surprise you? Williams: I don’t know if “surprised” is the right word. It’s more like a feeling of elevation. Everyone has done such incredibly profound work on this, and in such a variety of ways. For Wendy and I it was emotionally difficult as well to read these as they came in. We’re so proud of what everyone has done. There is so much heartfelt expression in this work. With gun control being such a contentious issue, have you gotten any pushback just for creating this anthology? Williams: Not as yet. Our hopes are that people will take it as intended, that it’s about helping others, while discussing the problems that have led to those people needing help in the first place. It’s about our collective human experiences surrounding the issues of gun violence. It’s a book that discusses solving the problem that can no longer be ignored. We didn’t send out a mandate to any of the contributors asking for their stories to lean one direction or another. We had a basic mission statement with a list of a variety of topics we were looking to be addressed in some form. We looked for a variety of perspectives, even if they were ones we might not agree with. By the end, if the book leans more toward one direction on the issues, then that is purely the tide at this time. But like I mentioned, our hopes are that people take the book as intended, that its purpose is to help others while facing the problems of gun violence. How are you handling donating the proceeds of the book? Williams: We're working with Route91Strong.org, an organization run by many who have been directly impacted by gun violence themselves. Where We Live comes out tomorrow. Signings are planned across the country in bookstores and comic shops - follow @WhereWeLive_LV to see if any of them are near you.